Principal Stevens and Ms. Martin (Assistant Principal) pose with a graduating kindergarten student from K01. After a few introductory remarks from Principal Stevens, students in all kindergarten classes entertained family members and special guests by singing 'How Far I'll Go'. The lyrics of this famous song, from the movie Moana, were written by Lin Manuel-Miranda. In the movie, Moana was ready to follow her dreams, and live the life that was meant for her. She just needed to take the first step. 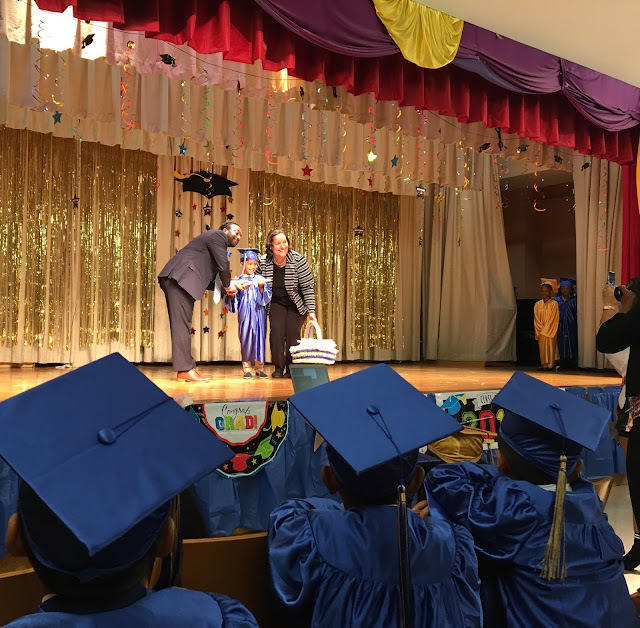 After a round of applause, our young scholars received their diplomas and joined family members, teachers and administrators in the gymnasium for refreshments.